Running from October 22, 2007 to January 6, 2008, the 07-08 Wikimedia Foundation fundraiser led to contributions totaling 2.162 million dollars from nearly 45,000 donors worldwide. This fundraiser was the most ambitious in the Foundation's history. Many initiatives were launched in parallel to increase the overall impact of our fundraising strategy. Given the Foundation's organizational bandwidth during the fundraiser time period (largely taken up by the relocation process and the hiring for the new office), the number of successfully completed initiatives is remarkable. This report summarizes some of the key changes and initiatives that took place, as well as the actual fundraising results from both the Foundation and the international Wikimedia chapter organizations. Donations made online can be tracked through our reporting engine. In addition to several checks and transfers not captured in the online reports, the Foundation received a contribution by a major donor of USD 500,000, a Google stock valued at USD 49,768 from another major donor, and a donation of USD 10,000. The overall contributions received during the fundraising period totaled USD 2,112,251.73 (unaudited figures). It is also instructive to review the report from the 06-07 fundraiser. That fundraising drive raised a total of just over USD 1 million, including two major donations, the larger of which totaled USD 300K. Traffic in that same period grew from an average of 15K-20K requests/second in December 2006 / January 2007 to an average of 25K-35K in the 07-08 fundraising period (see traffic statistics). Whether one accounts for major donations or not, the total raised in the 07-08 fundraiser represents more than an increase proportional to the traffic growth between the two drives. 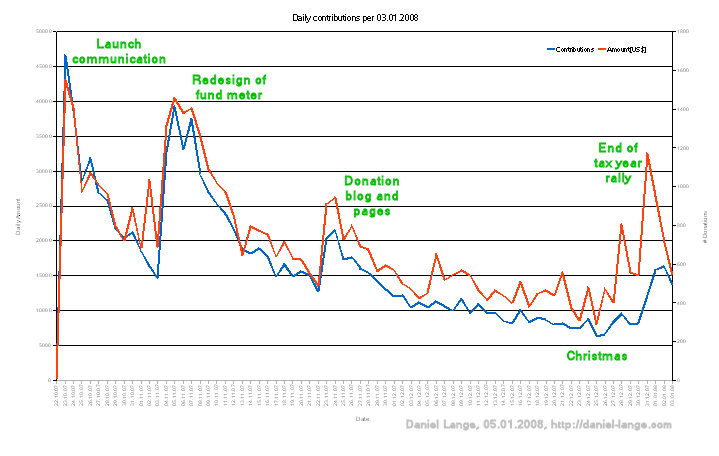 The 07-08 fundraiser ran significantly longer, initially picking up more slowly, but sustaining donation growth better than the 06-07 fundraiser. This likely relates in significant part to the different starting dates: December is a better fundraising month due to the high number of year-end donations made for tax reasons. It would be interesting to examine whether the audience demographics have changed since the 06-07 fundraiser, i.e., whether growth has been among population groups less likely to be willing or able to donate. This validates the associated decisions, in particular, to extend the fundraiser past its original end date of December 22. This fundraiser saw the most significant participation from the Wikimedia chapters so far. Wikimedia Germany, Wikimedia Switzerland, Wikimedia France, Wikimedia Netherlands, Wikimedia Italy, and Wikimedia Poland actively participated in the fundraiser, both through their own separate fundraising efforts and through the Foundation websites. Fundraising efforts are constrained by cultural differences and the level of organizational maturity of the chapters themselves. The iterative design process of the fundraising related pages also complicated integration of chapter-driven fundraising efforts into Foundation messaging. The lack of a clear understanding between chapters and the Foundation about the role and responsibilities of the different entities in the fundraising process is an additional impediment. For example: Should chapters share fundraising revenue with the Foundation, and if so, how? Direct transfers to the Foundation are constrained by the varying international laws governing non-profits. The German chapter has an informal agreement with the Foundation to invest half of its fundraising revenue in ways directly benefiting WMF projects. From the fundraising revenue in the 07-08 drive, Wikimedia Germany has already purchased EUR 50,000 in server infrastructure, hosted by Kennisnet in Amsterdam. These servers remain the property of the chapter, but directly serve the projects, and are used to alleviate Foundation capital expenditures in the same area. The Swiss chapter made a direct contribution of CHF 5,000 to the Foundation. The Italian chapter transferred its entire fundraising income from the fundraising period to the Foundation. To improve and build the chapter/Foundation relationship, the Chapters Coordinator recently completed a survey of chapters' perceptions, plans, and actions, which will serve as a foundation for future planning. In its October 6, 2007 Board meeting, the Board approved the budget for the Fiscal Year 2007 to 2008. This budget was also the basis for the publicized planned spending distribution, accompanied by some explanations. This represents the most detailed financial planning in the history of the organization. The publication of the planned spending was misunderstood by some to indicate that the fundraiser's goal was to raise 4.6 million dollars, i.e. the spending for the entire fiscal year. This was not the case. Also, given that most of the viewers of the planned spending distribution had no financial background, the level of explanations given was probably not sufficient; for example, some readers misunderstood the "Office of the Executive Director" item to mean that the Executive Director receives a salary of $500K/year, when of course the majority of this item is a allocated for spending that is directly under the ED's discretion, e.g. contractors and consultants, office relocation expenses, etc. A more detailed breakdown or more elaborate explanations should help to reduce such misunderstandings in the future. One of the key problems in past fundraisers was the difficulty of deploying identical messaging across all websites and all languages. Fundraising notices were project-local, meaning that changes had to be rolled out systematically in all languages, and could easily be overridden by anyone with project-local administrative privileges. The now implemented infrastructure allows all messaging changes and translations to be coordinated through a single wiki, Meta-Wiki. This has led to much faster deployment of both translations and messaging changes across wikis. The fundraising sitenotice as initially deployed visually resembled prior efforts. One major change was that no financial goal was indicated in the fundraising sitenotice itself. Instead, the number of donations was recorded and displayed as a progress bar. This was meant to be analogous to the egalitarian nature of Wikipedia itself: No single donor is more important than any other; people donate according to their ability, and according to their belief in the importance of Wikimedia's mission. Anecdotal feedback indicates that this change was sometimes misinterpreted: The number of people was thought to actually be a dollar figure, leading to comments such as: "Oh, only 30,000 dollars have been donated to Wikipedia?" Inquiries related to the actual financial target of the fundraiser were less common, probably in large part due to the publication of the Foundation's planned spending. The inital notice also received some criticism for being aesthetically unappealing, and community members led a collective brainstorming effort to come up with an improved design. In early November, the notice was replaced with a new design, developed by Jörg Petri, a designer from Berlin, Germany. Donations roughly doubled in the first few days after the new design was enabled, and remained higher than previous for more than a week. It is difficult to establish whether the new design also raised the floor of donations in the weeks following. It is worth noting that the design was translated into PHP code by Brion Vibber. In this process, Brion wrote code that makes it possible to use arbitrary SVG vector graphics as templates for fundraising meters or other indicators. This should greatly simplify the design process for future fundraisers. This fundraiser was the first one that was accompanied by a dedicated video appeal. The fundraising video used materials from the documentary "Truth in Numbers" about Wikipedia, and told a compelling story of how Wikipedia content is used globally. The video was hosted in many different formats and sizes, and the Wikimedia community created subtitled versions in 28 languages. Technologically, the video used a variant of the embedded video player also used in Wikimedia projects, with the additional option of Flash-based playback. Negative feedback on the video centered around the close-ups of Jimmy Wales' face and the accuracy of the Hindi script used in the introduction. As can be seen, hits went up again slightly after the introduction of the new fundraising page on December 25, 2007. Prominently features the Wikipedia brand, to avoid brand confusion. The current implementation ties directly into MediaWiki, making it relatively simple to translate and maintain the fundraising page - and making it part of our standard, open source tool sets which is serviced by staff and volunteers. Transitioning away from the previous landing pages, based on Drupal and MediaWiki, took a significant amount of time, but should prove to be a valuable investment in the future. The Wikipedia Academies were specifically identified as an event relevant to fundraising. Two Wikipedia Academies took place in South Africa, with the specific goal to promote Wikimedia project participation in African languages. Jimmy Wales introduced each event with a keynote (see press release). The event was picked up by a few media outlets and blogs, and was used during the fundraiser as an example of future outreach activities the Foundation might pursue. In future fundraisers, it would likely be beneficial to more systematically include documentation like the video of the event in the fundraising messaging. Wikimedia worked with an external PR company, Morris+King Company (MKC), for the purposes of media placements. MKC successfully placed interviews with Jimmy Wales in international media, including BBC World, CNBC, Bloomberg TV, CNN Radio, and Die Zeit. MKC also created a master celebrity contact list for a roster of names that was developed in concert with Jimmy, Executive Director Sue Gardner and Communications Manager Sandy Ordonez. This contact list was used for a major donor initiative (see below). Other MKC-led or MKC-assisted initiatives, including the Edit Wikipedia Week event, suffered from lack of planning and advance notice. Media placements regarding the South African Wikipedia Academy were largely unsuccessful: most major media have very limited resources to cover events in Africa. Sabine Cretella initiated a Wiki Love photo group, pictures from which were also featured on some of the projects. This was very widely announced throughout the communities, so the overall response rate was very low, indicating that the Wikimedia volunteer community may not be particularly responsive to this type of initiative. On the other hand, if Wikimedia's photo submission mechanisms are made more user-friendly as a general technical improvement, it may be useful to try a similar experiment during or before a fundraiser. A community event, Edit Wikipedia Week, was proposed to encourage workshops and meetings driving participation in the projects (to promote alternatives to financial contributions, and to generate media interest). There is little evidence of real world events that took place as a result, though a very nice poster was designed by a volunteer. Future initiatives of the same type will require more coordination; institutional interest was certainly there. Staff and volunteers collaborated on creating a set of buttons and banners to be featured on websites and blogs. This was probably the single most effective initiative, as many prominent Wikipedians added these buttons to their blogs. Wikia also participated in the fundraiser using these buttons. The "Why Give?" Fundraising Blog used the same theme as the new fundraising landing page. Comments were moderated by volunteers, especially by Andrew Whitworth and Thunderhead. The blog was syndicated in Planet Wikimedia. Some of the posts received hundreds of comments, while others received very few: "Why Wikipedia Does Not Run Ads" is a more interesting topic than the technical infrastructure of the projects. Aside from the content of the posts, there was probably also a general decline in the perceived "newness" and "interestingness" of the blog over time. It seems well worth experimenting with blogs as a communication tool in the future, irrespective of ongoing fundraisers. During the fundraiser each day approximately a dozen messages appeared in the donation queue of OTRS. This is a small number compared to the number of donations. There were some reports on privacy matters, people who didn't want to have their name appear on the donations list, but it did while they reportedly had chosen "donate anonymously". There were quite a few questions about PayPal, why do we use them, why do they ask so many details, why does PayPal try having donors login to a PayPal account. There were quite a few suggestions for other paymentprocessor. There were some complaints that it wasn't possible to donate from some countries, or in some specific currencies. Wikimedia has transitioned through several custom-built solutions to track online donations. The current reporting engine at http://donate.wikimedia.org/ represents an extension to the Drupal content management system. Its tracking and reporting abilities are extremely limited. For example, for the purposes of donor cultivation, it would be valuable to compare donor demographics, to track donors who make repeated donations, to identify donation clusters in time and space, to track the actual cultivation activities, and so on. These are features offered by dedicated fundraising software such as The Raiser's Edge, which are typically proprietary. In addition to the feature set, one consideration should be whether the fundraising activities can easily be scaled up to include trusted volunteers. Every donor was redirected to a page acknowledging their contribution. Tax receipt letters and donation acknowledgments were planned to be sent to donors making contributions >= USD 100 (or equivalent); a phone call was to be made to donors making contributions >= USD 10,000. The process of acknowledging donations is still ongoing. In order to encourage gifted donations, a gift certificate module was enabled along with the new fundraising landing page on Christmas day. This module allows donors to retrieve a PDF format gift certificate after making their donation. It was built pro bono by PediaPress, a German company which is creating open source wiki-to-print technology. During the fundraiser, Sue Gardner and Erik Möller began a first tour of potential major donors and partners in the Bay Area, facilitated by a personal friend to Jimmy Wales. Simultaneously, Sandy Ordonez, Sue Gardner, Guillaume Paumier and Erik Möller prepared an information package that was mailed to a list of potential donors and celebrities. (Guillaume deserves special credit for his excellent pro bono design work.) A dedicated email address for major gifts was established. The "roadshow" in the Bay Area and the general work on donor cultivation continues. The importance of this work is established by a major unrestricted donation made by an anonymous donor of $500,000. Sitenotice: The fundraising sitenotice is the primary gateway through which online donors arrive on the fundraising landing page. The sitenotice change in this fundraiser was associated with a dramatic increase on donations. Beyond the effectiveness of the notice, changing it regularly may also alleviate the issue of "banner blindness": If readers are confronted with a nearly identical notice every day, they may start to simply ignore it. Even basic messages on the progress of the fundraiser and smaller fundraising goals could have a significant impact. Landing page: After multiple transitions, we've arrived at the current solution for the fundraising landing page, i.e. a MediaWiki-based extension that makes it possible to implement arbitrary designs while relying on MediaWiki's internal mechanisms for versioning, translations, and so on. Given the difficulty of maintaining external tools, it seems wise to continue to refine and improve this integrated solution. Acknowledgment of donations: Every donor should receive a personalized e-mail acknowledging their gift. We should also make an effort to re-connect with donors after the fundraiser, and to cultivate major and recurring donors through direct messaging. Reporting and data capture: The current toolset is insufficient. For example, to obtain donor information, manual database queries had to be performed. The criteria for an adequate solution should be identified, followed by a comparison of existing proprietary and open source solutions. Wikimedia should collaborate with other like-minded non-profits facing the same problem set in this process. Recurring donations: The fundraising drive did not attempt to convert one-time donors to recurring donors, or to generally encourage recurring donations. Recurring donations have the obvious benefit of increasing financial predictability. A dedicated fundraising drive with the goal to, for example, build a basis of 10,000 people supporting Wikimedia at a rate of $10/month or more, could significantly contribute to organizational sustainability. Community initiatives: To the extent that the Foundation gets involved in community fundraising efforts at all, it should focus on those which have network effects, i.e., where individuals reach out to their networks, who reach out to their networks, and so forth. Banners and buttons are an example of that. Advance planning: In some ways, a fundraiser needs as much preparation as a Wikimania conference. Work on some aspects of the fundraiser, such as media strategy, should begin months before the fundraiser begins. Landing pages and sitenotice changes should also be finalized as early as possible -- a canned message is better than no message. The 07-08 fundraiser was an overall success. It improved upon previous efforts in many ways, and was an opportunity to experiment with new fundraising strategies and tactics. Further refinements to technology and processes should help to stabilize online fundraising income. The migration away from the current fundraising database to a more powerful solution represents a major effort that should begin as soon as possible. This page was last edited on 10 August 2015, at 12:38.